Roy Conklin founded the Conklin Pen Company in 1898 in Toledo, Ohio. The company produced innovative writing tools with iconic filling systems such as the crescent filler. 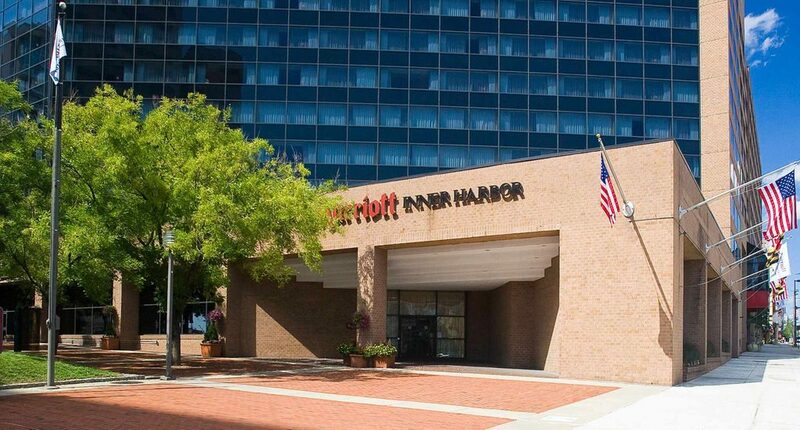 The company gained notoriety with the help of Mark Twain and his vocal support of their pens. 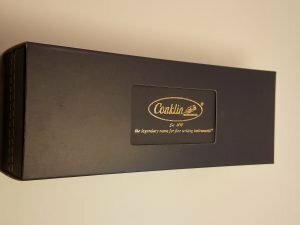 In 2009, the Conklin name and brand were purchased by YAFA, which has been in business since 1978. The founder, Yair (Jerry) Greenberg, has been bringing out modern pens with vintage looks. 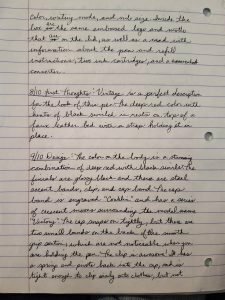 The review today is of the Conklin Victory fountain pen in red. The Victory is a “re-imagined” version of the Victory that was out during WW2 and was popular with soldiers. 8/10 Packaging: Conklin always does a nice job with their packaging. 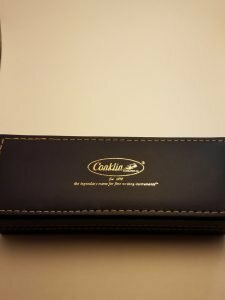 The pen comes in a deep blue faux leather box with yellow stitching around the border with gold embossing in the middle that has the Conklin logo, “Est 1898” and “The legendary name for fine writing instruments.” The box has a blue outer sleeve with a window cut in it to see the Conklin logo on the box, and has a sticker on the end and the bottom that gives the model name, color, writing mode, and nib size. Inside the box are the same embossed logo and motto that are on the lid, as well as a card with information about the pen and refill instructions, two ink cartridges, and a converter. 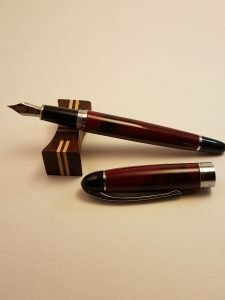 8/10 First Thoughts: Vintage is a perfect description for the look of this pen. The deep red color with hints of black swirled in rests on top of a faux beige leather bed with a strap holding it in place. 9/10 Design: The color on the body is a stunning combination of deep red with black swirls. The finials are glossy black and there are steel accent bands, clip, and cap band. The cap band is engraved “Conklin” and has a series of crescent moons surrounding the model name “Victory”. The cap snaps on tightly, but there are two small bands on the back of the smooth grip section, which are not noticeable when you are holding the pen. The clip is awesome! It has a spring and pivots back into the cap, and is tight enough to clip easily onto clothes, but not so tight as to not be usable. The grip section has plastic threads, but the body is metal so you cannot convert it to an eyedropper. 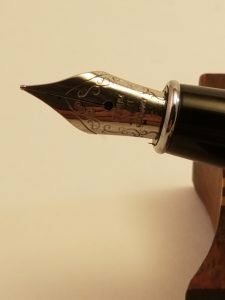 7/10 Nib Performance: The nib has a bit of feedback, but it is a wonderful, smooth, and wet writer. It has a small amount of engraving on it and is unbranded with “Iridium Point Germany” engraved on it. It would have been nice to see Conklin engraved on it, but that is a minor detail. 7/10 Filling System: C/C, push-in converter, rather than threaded like other Conklin converters. 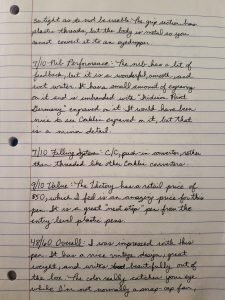 9/10 Value: The Conklin Victory fountain pen has a retail price of $50, which I feel is an amazing price for this pen. It is a great “next step” pen from the entry-level plastic pens. 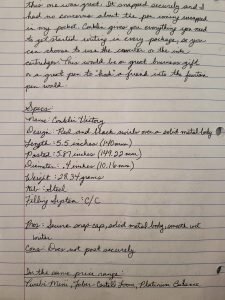 48/60 Overall: I was impressed with this pen. 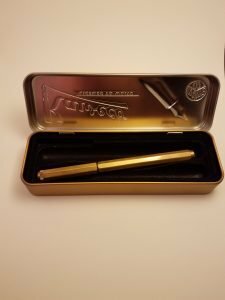 It has a nice vintage design, great weight, and writes beautifully out of the box. The color really catches your eye and while I am not normally a snap-cap fan, this one was great. It snapped securely and I had no concerns about the pen coming uncapped in my pocket. Conklin gives you everything you need to get started writing in every package, so you can choose to use the converter or the ink cartridges. 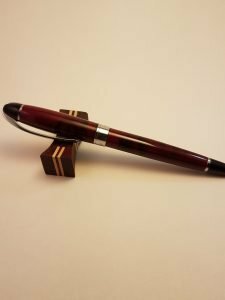 This would be a great business gift or a great pen to “hook” a friend into the fountain pen world. Bertram’s Inkwell thanks Eric and Jessy Aycock for their time and contribution with this wonderful review! 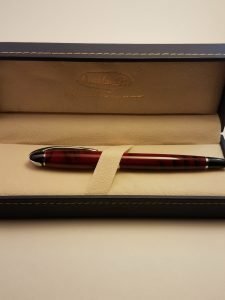 Check out the Conklin Victory Fountain Pen here. Kaweco has been producing high-quality writing instruments in Germany since 1883. 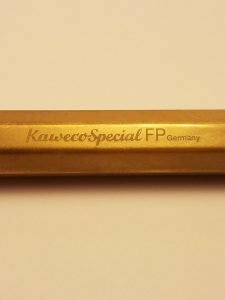 The company, which is known primarily for their “Sport” models of pocket pens and pencils, has a large range of writing implements ranging from entry level to “high-end.” Today I am reviewing the Kaweco Special brass fountain pen. 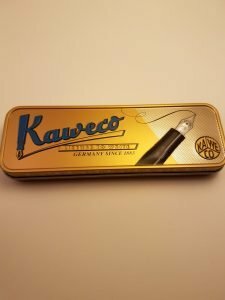 9/10 Packaging: The pen comes in a nicely crafted Kaweco-branded brass colored tin, with a glossy paper sleeve that has “Kaweco, License to write, Germany since 1883” printed on it and the “KA/WE/CO” circle logo. The tin makes a handy carrying case and has a two-slotted pen bed. Extra points for a dual-purpose box, since most packaging is thrown away for being bulky. 8/10 First thoughts: The pen is minimal, with no clip or roll stop, giving the pen a very streamlined utilitarian look. 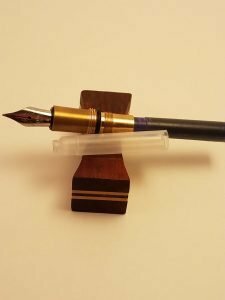 The color of the brass stands out well against the black color of the pen bed. 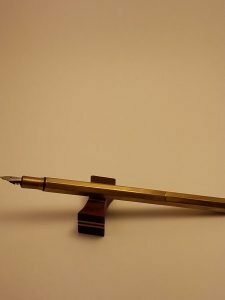 7/10 Design: The pen is made from solid brass and weighs in at 32 grams, which is heavy but not so heavy as to tire out your hand during longer writing sessions. The pen has a screw-on cap, which closes tightly against a small O-ring on the grip section. The cap can be posted securely by screwing it onto the threads on the bottom final, but this does make the pen slightly back weighted. When securing the body to the grip section, you have to tighten it down securely or it can unscrew when you are uncapping the pen. The grip section is small but has a slight flare, which prevents your fingers from sliding down onto the nib. The threads are barely noticeable and not sharp. The body has eight facets, which help to prevent the pen from rolling since it does not have a clip or roll stop, and has the “KA/WE/CO” circle logo on the cap finial. You can purchase an aftermarket slip on clip for around $6.00, if you would like to add one. The finish has lost a bit of the shine with use, but it can easily be polished to keep it looking new. I personally like the patina that develops as you use it. The collection also has a black version, as well as a dip pen version. 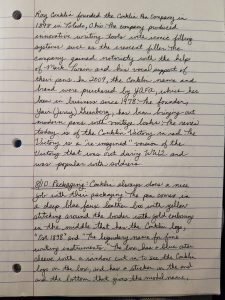 8/10 Nib Performance: The steel nib is a very smooth, slightly dry writer. I experienced no hard starts even after leaving the pen on my desk for a few days. The nib is engraved with a small bit of scrollwork, the “KA/WE/CO” circle logo, “Germany since 1883,” and “M” for Medium nib size. 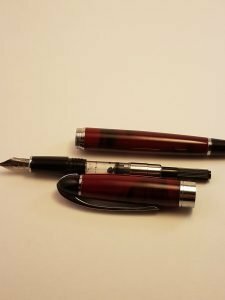 It is a smaller nib that definitely punches above its weight class. 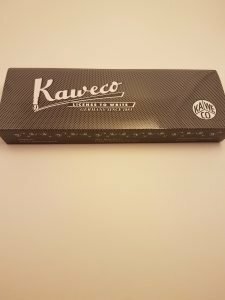 I have heard some quality control stories about Kaweco nibs, but this one was a dream to write with right out of the box. 8/10 Filling System: The pen is a cartridge/converter filling system. It comes with one cartridge and a spacer cartridge. If you prefer to use a converter, it is sold separately for around $3.00. 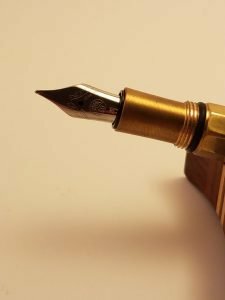 Since the pen is solid brass, you cannot eyedropper it. 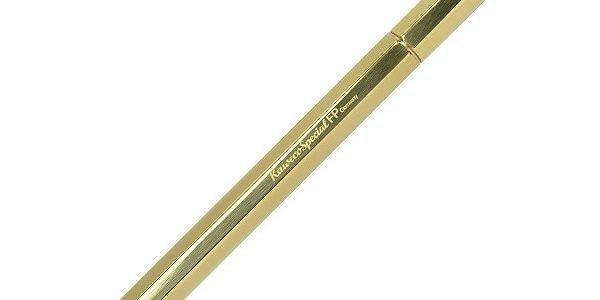 7/10 Value: The retail price for the Kaweco Special Brass fountain pen is $130, but you can typically find it on sale for less. Overall this is a bit high for this model. 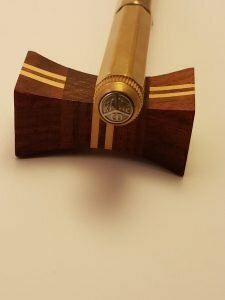 Understandably, it is solid machined brass, which can add to the price. I think a price of $70-$90 would be fair, especially since the clip and converter are sold separately. I feel the design is made to last for generations. You are getting a solid workhorse pen that will not disappoint. 47/60 Overall: The minimalist design is interesting. This is the first pen I have used that does not come with a clip. That gave me concerns that it might slip out of my pocket or pen pouch. I like the faceted design, and it feels solid and durable given the material and the finish. The nib performs really well and it is a great writer right out of the box. Any pen that can sit for a number of days and start right up with no hesitation is a great performer in my book and definitely should be considered when you are looking for that next every day carry pen. I just wish the price point was lower. 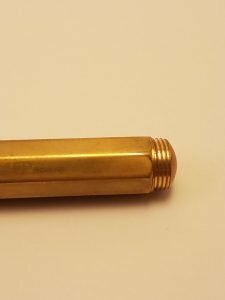 Check out the Kaweco Special Brass Fountain Pen here.